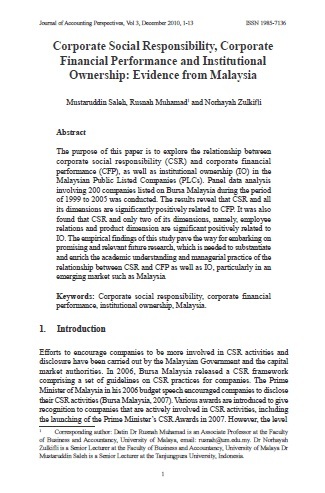 The purpose of this paper is to explore the relationship between corporate social responsibility (CSR) and corporate financial performance (CFP), as well as institutional ownership (IO) in the Malaysian Public Listed Companies (PLCs). Panel data analysis involving 200 companies listed on Bursa Malaysia during the period of 1999 to 2005 was conducted. The results reveal that CSR and all its dimensions are significantly positively related to CFP. It was also found that CSR and only two of its dimensions, namely, employee relations and product dimension are significant positively related to IO. The empirical findings of this study pave the way for embarking on promising and relevant future research, which is needed to substantiate and enrich the academic understanding and managerial practice of the relationship between CSR and CFP as well as IO, particularly in an emerging market such as Malaysia. SALEH, Mustaruddin; MUHAMAD, Rusnah; ZULKIFLI, Norhayah. Corporate Social Responsibility, Corporate Financial Performance and Institutional Ownership: Evidence from Malaysia. Asian Journal of Accounting Perspectives, [S.l. ], v. 3, n. 1, p. 1-13, dec. 2010. ISSN 0128-0384. Available at: <https://ajap.um.edu.my/article/view/3639>. Date accessed: 20 apr. 2019.